United Nations Secretary-General Tapped For Commencement United Nations (U.N.) Secretary-General Kofi A. Annan, will speak at Commencement this June, the University will announce today. The diplomat from Ghana has led the U.N. through contentious times as the world body oversees reconstruction in East Timor, Kosovo and Afghanistan, and searches for a role to play in Iraq. “Annan is a distinguished statesman engaged in many of today's most important global challenges,” University President Lawrence H. Summers said in a press release. 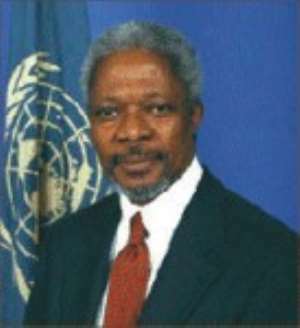 Annan, who has been secretary-general since January 1997, won the 2001 Nobel Peace Prize for his work to strengthen the role of the U.N. as an international force for peace. He has made the fight against the AIDS epidemic in Africa a personal priority of his administration. The career diplomat will address the class of 2004 and alumni during afternoon exercises, where he will receive an honorary degree. Reardon noted that Annan has been head of the U.N. at “a very critical time” in international affairs. The choice comes as the University increases its commitment to the study of international relations. Harvard International Relations Council President David K. Kessler '04 said Annan was a “dream” speaker and noted that Annan's success at remaining apolitical on the global scene makes him a unifying leader. Dominguez noted that the choice of Annan also underscores the University's push to expand the study of Africa. The Faculty of Arts and Sciences initiated the African Languages Program at the beginning of the academic year to significantly increase resources and classes for students studying Africa. Annan responded to an invitation by a committee composed of Summers, Baker, the president of the Board of Overseers, and a member of the Harvard Corporation.